Terminator 4 Has James Cameron’s Blessing? Sci-Fi filmmaking genius James Cameron hasn’t had much to do with Terminator since T2, though it’s gone on without him. Since his departure there’s been a third film, a television series, and now there’s a fourth movie titled Terminator Salvation in the works. Cameron’s still not involved, but it’s possible that he may actually approve of this particular Terminator incarnation. Our sister site Cinema Blend is reporting that JC has been in contact with T4 director McG, and has been giving him tips on casting. Read the full story over at CB. I’ve always been a major fan of Robert Heinlein. Actually, scratch that. I’ve always been a major fan of Robert Heinlein’s early work. Old age did not do well by Bob H, and as he got older his biting, pointed writing became bitter and the sexual freedom he espoused in his work turned into the mad ravings of a crazy old man who was clearly, despite his age, still very very horny. His early and mid-career work is genius though, and he’s one of the original fathers of meaningful, modern science fiction. He’s also written a lot of books, forty plus years of material actually, and even though I’m something of a Heinlein superfan there’s still some of his stuff I’ve missed. Stuff like “Farnham’s Freehold”. “Farnham’s Freehold” fell into my lap courtesy of my brother in-law, who’s blind and therefore has awesome access to all kinds of free reading material online. He has access to thousands of books in plain text format, which he then plugs into a voice program to read it back to him. 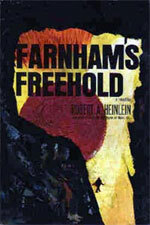 He had “Farnham’s Freehold” sitting on his computer, and when I saw Heinlein’s name on it I demanded he hand it over. So I spent the next few nights squinting into my Treo, where I’d dumped the text of the novel in a blatant act of literary piracy. Hey, give me a break here. It’s not like you can walk into a bookstore and find it on a shelf. I read whatever I can get my hands on. As a Heinlein fan I know how hit or miss he can be as an author, but it only took a few pages before I knew “Farnham” was a hit. The book instantly sucked me in, with its Cold War era tale of a family hiding inside a home constructed bomb shelter when the doomsday clock strikes eleven and nuclear war lands right on top of them. The interesting thing about Heinlein’s writing, perhaps here more than in anything else he’s ever done, is the way in which he manages to convey such a vivid picture of what’s happening… but without bothering with actual visual descriptions of the environment in which he thrusts his characters. Rather than describing the way his world looks, Heinlein chooses instead to describe the way his characters react to it, and through them his readers not only get the picture, but sometimes a deeper understanding than you’d get had he described simple surface knowledge. I’ve given it a few episodes now, and I think I’m ready to declare Terminator: The Sarah Chronicles good. Really good. Against all odds they’ve managed to retain the gritty, hard-edged action style of the movies while at the same time adding a more thoughtful, dramatic side to cater to the limited effects budgets and multiple episode requirements of television. A lot of the credit for it working has to go to Lena Headey, who, I wish had been playing the character all along. No offense to Linda Hamilton, it’s just that unlike Arnold as the Terminator, her performances in the movies simply haven’t aged well. I do have one question though. Are the scenes with the cops scripted by a different writing team? They seem entirely out of step with the rest of the series, and worse they’re incredibly clumsy. How many times do we have to watch Agent Ellison make some perfectly logical, intelligent point only to be shouted down by the gang of adolescent teens that serve as his colleagues? I’m getting a little sick of that dynamic. We get it, Ellison is on his own. No one believes in him. Now someone feed that blonde chick to this week’s Terminator.